With a deeper clean than vacuuming alone and less disruption than hot water extraction, encapsulation carpet cleaning can be a valuable part of any carpet maintenance plan. If you or your clients are unsure about introducing encapsulation into your cleaning rotation, this blog post will explain exactly what encapsulation entails and the top three benefits of this type of carpet cleaning. Encapsulation carpet cleaning involves encapsulating soils in a cleaning agent, and then vacuuming the dried crystals away. 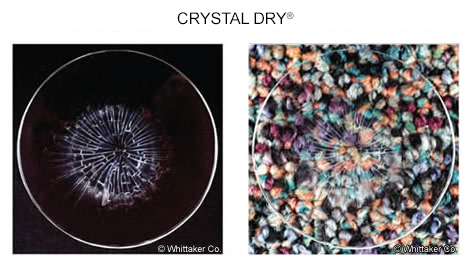 The Whittaker Smart Care® system is built around our CRYSTAL DRY® chemistry, which traps dirt in a clear polymer that is invisible to the naked eye. When performing encapsulation cleaning with the Smart Care® system, the carpet does not become soaked with water as it does with hot water extraction. The low moisture encapsulation cleaning method allows carpet to dry within about 20 minutes after the application of CRYSTAL® chemistry, meaning that facilities will experience less downtime and cleaning staff can work efficiently and quickly over large areas. In addition to faster dry times, less water means no wicking or resoiling. Wicking occurs after carpet stains are treated with cleaners and water; as the water evaporates, soils remaining at the bottom of the carpet fibers travel up to the visible surface of the carpet and make the stain reappear. Encapsulation avoids this problem by not oversaturating the carpet fibers, and trapping all the soil within the polymers that are then vacuumed away. Perhaps the most significant benefit of encapsulation cleaning is the improvement in carpet appearance and a longer life cycle for your facility’s carpets. Regularly removing embedded soils with encapsulation cleaning prevents the buildup of sticky residues that can attract more dirt and make your carpets look visibly soiled. The brushes on our Smart Care® machines not only agitate the encapsulation cleaning agents deep into the carpet, they also lift and open the pile at the same time. This helps your carpets look their best at the lowest cost all year round. Read about all of our encapsulation carpet cleaning chemistry here. If you have any questions about the Smart Care® system or about encapsulation cleaning, please reach out to us at 800-422-7686 or at info@whittakersystem.com. Our Brand Commitment – Making sure that every square foot of carpet adds to the beauty of a facility as its manufacturers, architects, designers, and installers intended.